Invariant NKT (iNKT) cells are a unique subset of T lymphocytes that rapidly carry out effector functions following activation with glycolipid Ags, such as the model Ag α-galactosylceramide. Numerous studies have investigated the mechanisms leading to Th1 and Th2 cytokine production by iNKT cells, as well as the effects of the copious amounts of cytokines these cells produce. Less is known, however, about the mechanisms of iNKT cell cytotoxicity. In this study, we investigated the effect of Ag availability and strength, as well as the molecules involved in iNKT cytotoxicity. We demonstrate that the iNKT cell cytotoxicity in vivo correlates directly with the amount of CD1d expressed by the targets as well as the TCR affinity for the target glycolipid Ag. iNKT cells from spleen, liver, and thymus were comparable in their cytotoxicity in vitro. Surprisingly, we show that the Ag-specific cytotoxicity of iNKT cells in vivo depended almost exclusively on the interaction of CD95 (Fas) with CD178 (FasL), and that this mechanism can be efficiently used for tumor protection. Therefore, unlike NK cells, which rely mostly on perforin/granzyme-mediated mechanisms, the Ag-specific cytotoxicity of iNKT cells in vivo is largely restricted to the CD95/CD178 pathway. Invariant NKT (iNKT) cells are a unique subset of T lymphocytes characterized by the expression of an invariant Vα14-Jα18 TCR rearrangement (Vα14iNKT cells) and the recognition of CD1d, a nonpolymorphic MHC class I homolog. CD1d binds lipid structures, and one of the best studied Vα14iNKT cell Ags is α-galactosylceramide (αGalCer), a glycolipid originally isolated from a marine sponge, or perhaps more likely, from a Sphingomonas microorganism associated with the sponge (1, 2). Activation with this model Ag leads to rapid induction of effector functions by Vα14iNKT cells. Indeed, the identification of αGalCer was largely based on the discovery of its antitumor activity (1, 2), and numerous studies have described the strong iNKT cell- and CD1d-dependent antitumor properties of αGalCer. Previous studies on iNKT cell effector functions have focused principally on their strong and rapid production of Th1 and Th2 cytokines (3–6). However, less attention has been given to their cytotoxic potential. Some reports demonstrate NK cell-like cytotoxicity of iNKT cells following activation with IL-12 (7–14) or αGalCer (1, 2, 15–27). However, few studies have addressed the Ag specificity of this cytotoxicity. We previously demonstrated Ag-specific cytotoxicity by transgenic, non–Vα14i-expressing CD8+ NKT (tgNKT) cells (28). However, little is known about the properties of and requirements for Ag-specific cytotoxicity by iNKT cells (24, 29, 30). To achieve a better understanding of the cytotoxic potential of iNKT cells in vitro and in vivo, we used an Ag-specific in vivo cytotoxicity assay (28, 31). We investigated the effect of Ag availability and strength on iNKT cell cytotoxicity and found a positive correlation between these two parameters. Furthermore, we demonstrate that the Ag-specific iNKT cell cytotoxicity in vivo depends on the interaction of CD95 and its ligand CD178. Additionally, we demonstrate that the direct Ag-specific cytotoxicity by iNKT cells can be used for antitumor responses. All mice were housed under specific pathogen-free conditions at the animal facilities of the La Jolla Institute for Allergy and Immunology (La Jolla, CA) and The Scripps Research Institute (La Jolla, CA) in accordance with the Institutional Animal Care Committee guidelines. Experiments were performed according to animal experimental ethics committee guidelines. C57BL/6J mice (no. 000664), CD45.1 congenic B6.SJL mice (no. 002014), and mice deficient for perforin (no. 002407), CD95/Fas (no. 000482), and CD178/FasL (CD95L; no. 001021) on the C57BL/6 background were purchased from the The Jackson Laboratory (Bar Harbor, ME). B6.129-Tcra-Jtm1Tgi (Ja18−/−) mice and CD1d-deficient mice (CD1d−/−) on the C57BL/6 background were a gift from Dr. M. Taniguchi (RIKEN Institute, Yokohama, Japan) and Dr. Luc Van Kaer (Vanderbilt University, Nashville, TN), respectively. The B lymphoma A20 (BALB/cAnN; no. TIB-208) and the melanoma B16-F10 (C57BL/6; no. CRL-6475) were purchased from the American Type Culture Collection (Manassas, VA) and were virally transfected to stably express CD1d as previously described for A20 (32), resulting in the lines A20-CD1d and B16-CD1d. αGalCer ((2S,3S,4R)-1-O-(α-d-galactopyranosyl)-N-hexacosanoyl-2-amino-1,3,4-octadecanetriol) and OCH were obtained from the Kirin Pharmaceutical Research (Gunma, Japan). C-glycoside (C-Gly) and galacturonosyl glycosphingolipid (GalA-GSL; GSL-1′) were obtained from the National Institutes of Health Tetramer Core Facility (Emory University, Atlanta, GA). Carboxyfluorescein diacetate–succinimidyl ester (CFDA-SE) was obtained from Invitrogen (Carlsbad, CA). mAbs against the following mouse Ags were used in this study: CD1d (1B1), CD3ε (145.2C11, 17A2), CD4 (GK1.5, RM4-5), CD8α (53-6.7, 5H10), CD11b (M1/70), CD11c (HL3), CD19 (1D3, 6D5), CD21/CD35 (7G6), CD23 (B3B4), CD24 (M1/69), CD25 (PC61.5), CD44 (IM7), CD45.1 (A20), CD45.2 (104), CD45R(B220, RA3-6B2), CD69 (H1.2F3), CD95/Fas (Jo2), CD178/FasL (MFL3), TCRβ (H57-597), Thy1.2 (30-H12, 53-2.1), NK1.1 (PK136), Ly6CG (Gr1), perforin (CB5.4, eBioOMAK-D), granzyme B (GB11), TNF-α (MP6-XT22), IL-4 (11B11), and IFN-γ (XMG1.2). Abs were purchased from Abcam (Cambridge, MA), BD Biosciences (San Diego, CA), BioLegend (San Diego, CA), eBioscience (San Diego, CA), or Invitrogen (Carlsbad, CA). Abs were biotinylated or conjugated to Pacific Blue, Alexa Fluor 405, Pacific Orange, V500, FITC, Alexa Fluor 488, PE, PE-Texas Red, PerCP, PerCP-Cy5.5, PE-Cy7, allophycocyanin, Alexa Fluor 647, Alexa Fluor 700, allophycocyanin-Cy7, allophycocyanin-Alexa Fluor 750, or allophycocyanin-eFluor 780. Anti-mouse CD16/32 used for FcR blocking was isolated in our laboratory. Purification of mouse CD1d and preparation of PE- and allophycocyanin-conjugated αGalCer-loaded CD1d tetramers were produced as described (33). Single-cell suspensions were prepared from the liver, spleen, and thymus. Prior to extraction, the liver was perfused with PBS via the portal vein until opaque and meshed through a 100-μm cell strainer (BD Biosciences, San Diego, CA) and washed. Total liver cells were then resuspended in a 40% isotonic Percoll solution (Amersham Biosciences, Piscataway NJ) and underlaid with a 70% isotonic Percoll solution. After centrifugation for 20 min at 900 × g, mononuclear cells were isolated from the 40%/70% interface. The cells were washed once with medium. For the spleen and the thymus, lymphocytes were filtered through a 70-μm cell strainer (BD Biosciences). With splenocytes indented for in vitro cultures, RBCs were lysed (red cell lysis buffer [RCLB] from Sigma-Aldrich, St. Louis, MO) and WBCs were washed once with medium (RPMI 1640; Invitrogen, Carlsbad, CA) supplemented with 5% (v/v) FCS (Mediatech, Manassas, VA), 1% (v/v) penicillin-streptomycin-glutamine (10,000 U/ml penicillin, 10,000 μg/ml streptomycin, 29.2 mg/ml l-glutamine; Invitrogen), and 50 μM β-mercaptoethanol (Sigma-Aldrich). For the in vivo cytotoxicity assay, spleen B cells were purified by positive selection with anti–CD19-conjugated magnetic beads (Miltenyi Biotec, Auburn, CA) according to the manufacturer’s instructions. For enrichment of Vα14i NKT cells from splenocytes and thymocytes, cells were incubated with PE-conjugated NK1.1 (PK136) followed by positive selection with anti-PE magnetic beads (Miltenyi Biotec). Liver-associated lymphocytes were used directly. B16 and B16-CD1d melanoma cells were either loaded with 250 ng/ml αGalCer (37°C, 90 min) or mock treated, washed twice with PBS, and 1 × 105 tumor cells were injected i.v. into C57BL/6 mice as indicated. Fourteen days after challenge the numbers of metastatic nodules on the lung surface were counted. Three hundred fifty tumor nodules were established as the upper limit for counting, as at higher densities discrete tumor nodules could not be separated accurately. For staining of cell surface molecules, cells were suspended in staining buffer (PBS, 1% BSA, 0.01% NaN3) and stained with fluorochrome-conjugated Ab at 0.1–1 μg/106 cells for 15 min in a total volume of 50 μl. FcγR-blocking Ab anti-CD16/32 (2.4G2) and unconjugated rat IgG (Jackson ImmunoResearch Laboratories, West Grove, PA) were added to prevent nonspecific binding. If biotin-conjugated Abs were used, cell-bound Abs were detected with streptavidin conjugates (1:200) in a second incubation step. Staining of T cells with αGalCer-loaded CD1d tetramers (34) was performed as described previously. In brief, cells were stained with the tetramer together with other surface mAbs in staining buffer at 4°C for 30 min. For analysis of intracellular cytokines, cells were fixed and permeabilized using the Cytofix/Cytoperm reagents (BD Biosciences, San Diego, CA) for 10 min at 37°C. Cells were washed twice and incubated for 30 min with fluorochrome-conjugated Ab and unconjugated rat and mouse IgG in Perm/Wash solution (BD Biosciences), which was followed by an additional 5 min incubation in Perm/Wash solution without mAb. For in vitro experiments intended for intracellular staining, GolgiPlug and GolgiStop (BD Biosciences) were added for the last 4 h of incubation. Cells were analyzed with FACSCalibur, FACSCanto, or LSR II (BD Biosciences), and data were processed with CellQuest Pro (BD Bioscience) or Flow Jo (Tree Star, Ashland, OR) software. Graphs derived from digital data are displayed on a “logical scale” (35). In vivo cytotoxicity assays were performed according to Coles et al. (31) with minor alterations. Splenic B cells were purified as described and either pulsed with the indicated glycolipids (250 ng/ml, 1 h at 37°C) and labeled with a high concentration of CFDA-SE (1 μM, 15 min at 37°C; CFSEhigh cells) or were mock treated and labeled with a low concentration of CFDA-SE (0.15 μM; CFSElow cells). Cells were washed three times with PBS and equal numbers of cells from each population were injected i.v. (total of 1 × 107 target cells). Animals were sacrificed after indicated times, and the presence of target cells in spleen and liver was determined by flow cytometry. To calculate specific lysis of the in vivo cytotoxicity assay, the following formula was used: percentage specific cytotoxicity = 100 − [100 × (CFSEhigh/CFSElow)C57BL/6/(CFSEhigh/CFSElow)iNKT cell-deficient]. For in vitro cytotoxicity assays the tumor cells were either pulsed with αGalCer (250 ng/ml, 1 h at 37°C) or were mock treated, mixed at an equal ratio, and 1 × 105 cells were incubated with iNKT cell-enriched lymphocytes at indicated ratio for 4 h. Tumor cells used were either A20 and A20-CD1d or RMA together with B16 or B16-CD1d. Later pairings were labeled with CFDA-SE (0.15 μM; 15 min at 37°C). A20/A20-CD1d targets cells were distinguished based on forward light scatter (FSC)/side light scatter (SSC) characteristics and CD1d expression. RMA/B16 and RMA/B16-CD1d target cells were distinguished based on FSC/SSC characteristics and TCRβ expression. Results are expressed as mean ± SEM. Comparisons were drawn using a two-tailed Student t test (Excel; Microsoft, Redmond, WA) or ANOVA test (GraphPad Prism; GraphPad Software, San Diego, CA). Each experiment was repeated at least twice. Graphs were generated with GraphPad Prism (GraphPad Software). We applied an in vivo cytotoxicity assay that has been used to study conventional CD8+ T cells (31) and tgNKT cells (28) for the investigation of the Ag-specific cytotoxicity of iNKT cells. To generate targets, whole splenocytes were loaded in vitro with αGalCer or incubated with medium as a control, differentially labeled with CFSE, injected i.v., and 16 h later the cytotoxicity was analyzed. We detected Ag-specific cytotoxicity of 30.4 ± 1.7% against the αGalCer-loaded splenocytes when compared with control targets (Fig.1A, 1B). As reported previously (29), this in vivo cytotoxicity was dependent on iNKT cells, as it was not detected in mice deficient for Jα18 (Fig. 1A) or CD1d (data not shown). Using congenic and surface markers, we then dissected the different splenocyte subsets to determine whether there was preferential elimination of certain cell types by iNKT cells in vivo. As shown in Fig. 1B, the in vivo cytotoxicity of iNKT cells varied significantly for different cell populations, ranging from no cytotoxicity against NK cells (0.4 ± 2.8%) to almost complete elimination of marginal zone B cells (87.3 ± 0.3%). Based on the hypothesis that cytotoxicity is likely influenced by the amount of Ag presented on the cell surface of the target cell, and because it is known that marginal zone B cells have very high expression levels of surface CD1d (36, 37), we analyzed CD1d expression by different splenic cell populations. The CD1d expression levels indeed varied between the different lymphoid and myeloid populations (Fig. 1C), and they correlated directly with the observed in vivo cytotoxicity by iNKT cells (Fig. 1D, R2 = 0.912). Purified CD19+ B cells were thereafter used as target cells to maximize cytotoxicity and consequently the sensitivity of the in vivo assay. This optimization based on target cell type allowed us to detect in vivo cytotoxicity of 40–60% within 4 h of incubation in vivo. In vivo cytotoxicity of iNKT cells correlates with CD1d expression. A, CD45.1+ congenic C57BL/6 splenocytes were differentially labeled in vitro with CFSE and αGalCer, injected into CD45.2+ C57BL/6 and Jα18−/− mice, and analyzed 16 h later. Representative histograms show the elimination of the αGalCer-loaded CFSEhigh splenocytes (left panel) or the B cell population (CD3ε−/CD19+, right panel) in C57BL/6 (bottom panel) but not in iNKT cell-deficient mice (top panel). B, CD45.1 congenic C57BL/6 splenocytes were stained for surface markers 16 h after injection into CD45.2+ C57BL/6 and Jα18−/− mice, and the specific cytotoxicity was calculated for the indicated cell populations: T cells, CD3ε+/CD19−; CD4, CD4+ T cells (CD3ε+/CD19−/NK1.1−/CD4+); CD8, CD8+ T cells (CD3ε+/CD19−/NK1.1−/CD8α+); B cells, CD3ε−/CD19+; FOB, follicular B cells (CD3ε−/CD19+/CD21high/CD23high); MZB, marginal zone B cells (CD3ε−/CD19+/CD21high/CD23low/int); NK cells, CD3ε−/CD19−/NK1.1+; myeloid cells including CD11b+, CD3ε−/CD19−/CD11bhigh; CD11c+, CD3ε−/CD19−/CD11chigh; Ly6CG+, CD3ε−/CD19−/Ly6CGhigh. C, CD1d expression on indicated splenocytes with naming as specified under B. D, Graphic correlation of the data depicted in B and C (R2 = 0.912). Representative data from at least three independent experiments are shown for each panel. FOB, follicular B cell; MZB, marginal zone B cell. The highest proportion of iNKT cells within the lymphocyte compartment is found in the liver (4, 38, 39), and liver iNKT cells have been reported to be more effective in the in vivo response to a methylcholanthrene-induced sarcoma (40). Therefore, we were interested to compare the in vivo cytotoxicity of splenic versus hepatic iNKT cells. Interestingly, when we analyzed the Ag-specific iNKT cell cytotoxicity against αGalCer-loaded B cells in the liver we obtained values that were either very low or in most cases negative (Fig. 2A and data not shown). The local immune system of the liver has previously been shown to actively promote tolerance rather than immunity (41, 42). Therefore, it could be argued that the tolerogenic environment of the liver was blocking the cytotoxicity of the liver iNKT cells in situ. However, due to the measured negative values of the in vivo cytotoxicity assay, we hypothesized that the αGalCer-loaded target cells might be trapped in the liver, thus distorting the ratio of αGalCer-loaded to unloaded B cell targets. Therefore, we analyzed the ratio of both target populations in liver and spleen over time. As expected, the ratio of Ag-loaded target cells to control target cells decreased continuously in the spleen (Fig. 2B), in line with the increased cytotoxic removal of Ag-loaded target cells over time. In contrast, this ratio increased rapidly in the liver and was followed by an Ag-specific reduction (Fig. 2B). This observation is in agreement with the notion that αGalCer-loaded B cell targets accumulate in the liver in an Ag- and iNKT cell-dependent manner during at least the first hour in vivo after injection. This accumulation in the liver cannot account for the decrease in the spleen, as the liver has many fewer targets cells. We estimate that if all of the ∼50% increase in αGalCer-loaded target B cells in the liver were due to cells from spleen, this would contribute <5–10% of the total estimated cytotoxicity. Therefore, the decrease in the spleen likely reflects mostly cytotoxicity there. Consequently, we concluded that the accumulation of αGalCer-loaded B cell targets in the liver exceeds the capacity of the normal cytotoxic function of the liver resident iNKT cells at early time points. Nevertheless, the cytotoxic capacity of spleen and liver resident iNKT cells appears similar. Ag-loaded target cells accumulate in the liver. A, αGalCer-specific in vivo cytotoxicity in spleen and liver 4 h after injection of B cell targets into C57BL/6 and Jα18−/− mice. Representative data from at least three independent experiments are shown. B, Ratio of the proportion of αGalCer-loaded to unloaded B cell targets in C57BL/6 mice compared with Jα18−/− mice at the indicated incubation times in vivo. A value of 1.0 indicates a similar ratio of αGalCer-loaded to unloaded B cell targets in mice with (C57BL/6) and without (Jα18−/−) iNKT cells. The graph summarizes data from spleen and liver from two independent experiments with at least four mice per time point. We next analyzed the activation of the iNKT cells by αGalCer-loaded B cell targets. As shown in Fig. 3, the αGalCer-loaded B cell targets stimulated iNKT cells in spleen and liver to upregulate the activation markers CD69 and CD25 after 4 h. This upregulation was seen as early as 2 h after the injection of the B cell targets (data not shown). Furthermore, the iNKT cells produced the cytokines IFN-γ, TNF-α, and IL-4 within 4 h after the injection of the target cells (Fig. 3B). These data demonstrate that αGalCer-loaded B cell targets activate iNKT cells in the spleen and liver. As with the iNKT effector cells, the B cell targets also were activated, as measured by the upregulation of CD69 and CD25, both in spleen and liver (Fig. 3C). Taken together, these data indicate that liver iNKT cells do not have an activation defect during the in vivo cytotoxicity assay. Mutual activation in vivo of αGalCer-loaded targets and iNKT cells. 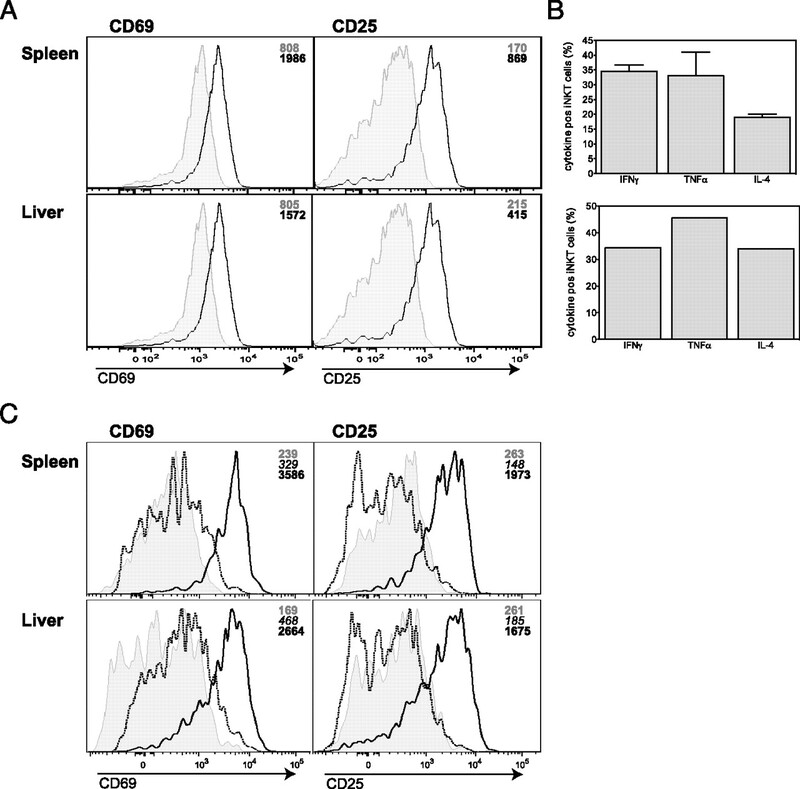 A, Representative expression levels of CD69 (left panel) and CD25 (right panel) on spleen (top panel) and liver (bottom panel) iNKT cells 4 h after injection of B cell targets into C57BL/6 mice. The numbers in histograms denote the geometric mean values for depicted Ags on iNKT cells from indicated organs. Tinted indicates C57BL/6 uninjected control mice (first number, gray); black indicates C57BL/6 mice injected with B cell targets (second number, black). B, Production of indicated cytokine by iNKT cells in spleen (top) and liver (bottom) 4 h after injection of B cell targets; n = 3, with data for liver derived from pooled samples. The in vivo cytotoxicity in this particular experiment was 35 ± 2.3% for the spleen and −72% for the liver. C, Representative expression levels of CD69 (left panel) and CD25 (right panel) on spleen (top panel) and liver (bottom panel) in B cell targets 4 h after injection into C57BL/6 and Jα18−/− mice. The numbers in histograms denote the geometric mean values for depicted Ags on B cells targets from indicated organs. Tinted indicates αGalCer-loaded targets recovered from Jα18−/− mice (first number, gray); black indicates αGalCer-loaded targets recovered from C57BL/6 mice (third number, black); dotted indicates unloaded control targets recovered from C57BL/6 mice (second number, black italic). Representative data from at least three independent experiments are shown. To compare the intrinsic cytotoxicity of iNKT cells derived from different organs side by side, we used a flow cytometric assay similar in principle to the in vivo assay. A20 B lymphoma cells and A20 cells transfected with a construct driving the expression of mouse CD1d (A20-CD1d) were used as targets. Although A20 cells are H2d haplotype, we could not detect in vitro NK type killing during the 4 h incubation time with H2b iNKT cells (data not shown). The A20 cell line does not express detectable levels of CD1d and is not killed by iNKT cells when loaded with αGalCer (data not shown). As A20 and A20-CD1d displayed identical growth within 48 h, both cell lines could be used as targets without the need of prior CFSE labeling. Target cells were identified by size (FSC versus SSC) and CD19 expression and differentiated based on their CD1d expression levels. Using this protocol we assessed the Ag-specific cytotoxicity of iNKT cells from thymus, spleen, and liver. In all experiments the cytotoxicity of iNKT cells from all three organs was comparable (Fig. 4), demonstrating that iNKT cells have similar cytotoxic capability irrespective of the organ of their origin. In vitro cytotoxicity by iNKT cells from different organs. αGalCer-specific in vitro cytotoxicity of NK1.1-enriched single-cell suspensions from indicated organs against A20 lymphoma cells with or without CD1d transfection (A20-CD1d) after 4 h of coculture. 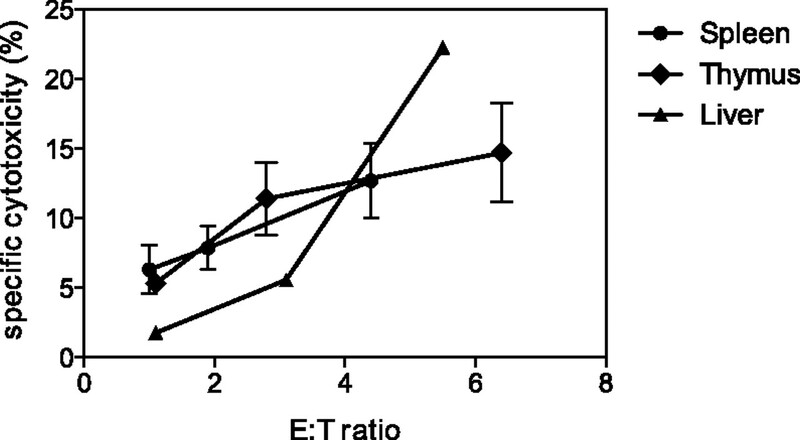 E:T ratios were calculated based on the ratio of iNKT cell numbers in the cell suspensions to the αGalCer-loaded tumor cells. nspleen = 4; nthymus = 2; nliver = 1. Representative data from three experiments are shown. We next analyzed the Ag-specific cytotoxicity of iNKT cell for CD1d-presented glycosphingolipid Ags with different antigenic potencies. We compared iNKT cell cytotoxicity against αGalCer-loaded targets with two of its synthetic derivatives, OCH and C-Gly (43). OCH is a weaker iNKT cell Ag than αGalCer and induces a systemic Th2 response (43–46). C-Gly is the weakest of these three Ags and induces a systemic Th1 response (43). As shown in Fig. 5 the cytotoxicity of iNKT cells in vivo directly correlated with the potency of the iNKT cell Ag (αGalCer > OCH > C-Gly). Although we could not detect any cytotoxicity against B cell targets loaded with C-Gly, the cytotoxicity against OCH-loaded targets reached 22–35% of the cytotoxicity observed with αGalCer (Fig. 5A). Furthermore, the in vivo cytotoxicity correlated with the intensity of CD25 upregulation on the Ag-loaded B cell targets (Fig. 5B) and the intensity of the observed iNKT cell stimulation, as measured by upregulation of activation markers and cytokine production (data not shown). We also tested the in vivo iNKT cell cytotoxicity against B cells loaded with a synthetic version of the Sphingobium yanoikuyae glycolipid GalA-GSL (called GSL-1′ in earlier publications) (47, 48). The iNKT cell cytotoxicity against the GalA-GSL–loaded targets was low, reaching only 3–9% of the cytotoxicity observed with αGalCer-loaded targets (Fig. 5C). Furthermore, we did not observe upregulation of CD25 on the GalA-GSL–loaded B cell targets (data not shown). In vivo cytotoxicity by iNKT cells correlates with antigenic potency. A, B cell targets were loaded in vitro with indicated iNKT cell Ags, injected i.v. into C57BL/6 and CD1d−/− mice, and the corresponding in vivo cytotoxicity was measured 18 h after injection. The p values are indicated. OCH values represent 24% of the values obtained with αGalCer, with values of 22 and 35% in two other experiments. 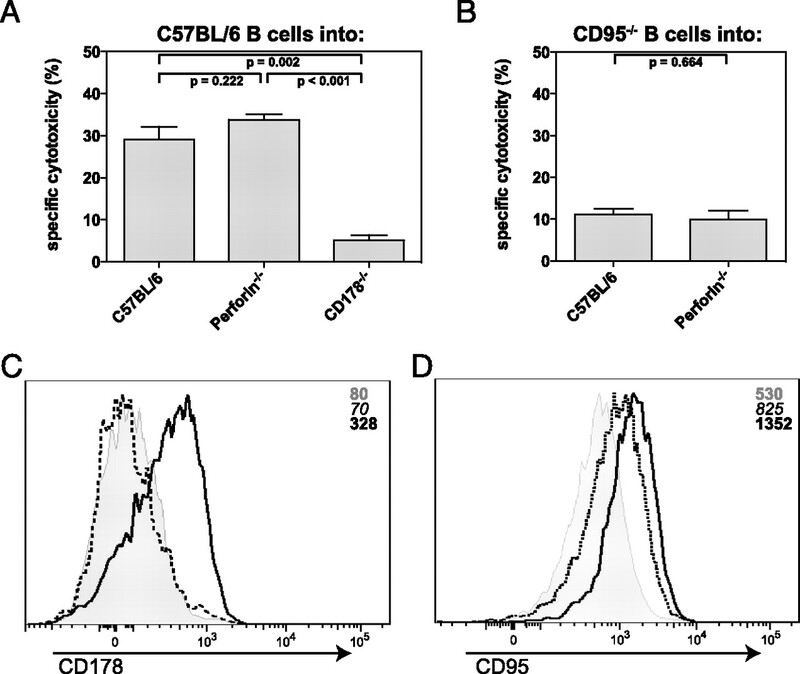 B, Representative expression levels of CD25 on splenic Ag-loaded B cell targets 18 h after injection into C57BL/6 and CD1d−/− mice. The numbers in histograms denote the geometric mean values of CD25 on Ag-loaded B cells targets. Tinted indicates αGalCer-loaded targets from CD1d−/− mice (first number, gray); long dashed indicates C-Gly-loaded targets from C57BL/6 mice (second number underlined); dotted indicates OCH-loaded targets from C57BL/6 mice (third number italic); black indicates αGalCer-loaded targets from C57BL/6 mice (fourth number, bold font). C, B cell targets were loaded in vitro with indicated iNKT cell Ags, injected i.v. into C57BL/6 and control CD1d−/− mice, and the corresponding in vivo cytotoxicity was measured 18 h after injection. GalA-GSL values represent 6% of the values obtained with αGalCer, with values of 3 and 9% in two other experiments. Representative data from two (B) or three (A, C) independent experiments are shown. To gain insight into the Ag-specific cytotoxic mechanisms employed by iNKT cells in vivo, we analyzed perforin- and CD95-deficient hosts. As shown in Fig. 6, the lack of perforin had no significant effect on the observed in vivo iNKT cell cytotoxicity, either alone or in conjunction with the lack of CD95 on the targets cells (Fig. 6A, 6B). In contrast, deficiency for either CD178 in the host (Fig. 6A) or of CD95 on the B cell targets (Fig. 6B) resulted in a significant decrease in the observed Ag-specific in vivo iNKT cell cytotoxicity. The remaining cytotoxicity in the absence of the CD95/CD178 pathway was between 17.6 and 28.5%, with a mean 23.4% of the C57BL/6 value, when normalized to 100%. In accordance with the results of the in vivo cytotoxicity assay, we observed upregulation of CD178 on iNKT cells stimulated with αGalCer-loaded B cells (Fig. 6C) and the upregulation of CD95 expression by the B cell targets from the same mice (Fig. 6D). Furthermore, we could not detect granzyme B or perforin by either stimulated or control iNKT cells (data not shown). Collectively, these data demonstrate that the in vivo cytotoxicity of iNKT cells depends mainly on the CD95/CD178 interaction. iNKT cell cytotoxicity depends on CD95/CD178 interactions. A and B, B cell targets derived from C57BL/6 (A) or CD95-deficient (B) mice were loaded in vitro with αGalCer, injected i.v. into the indicated and Jα18−/− control mice, and the corresponding in vivo cytotoxicity was measured 4 h after injection. The p values are indicated. C, CD178 expression on iNKT cells 4 h after injection of αGalCer-loaded B cell targets into CD178-deficient mice (tinted; first gray number) or C57BL/6 mice (black; third black number) or from uninjected C57BL/6 control mice (dotted; second black italic number). The numbers in histograms denote the geometric mean values of CD178 on iNKT cells from the indicated mice. D, CD95 expression on B cell targets 4 h after injection. The numbers in histograms denote the geometric mean values of CD95 on B cells. Tinted indicates αGalCer-loaded B cell targets injected into Jα18−/− mice (first number, gray); black indicates αGalCer-loaded targets injected into C57BL/6 mice (third number, black); dotted indicates unloaded control targets injected into C57BL/6 mice (second number, black italic). Representative data from at least two independent experiments are shown. Given the strong cytotoxicity we observed against CD1d-expressing targets, we determined if this direct Ag-specific cytotoxicity could be used for antitumor responses. The B16 melanoma aggressively grows in vivo, but protection can be conferred by concurrent stimulation of iNKT cells via IL-12 (10, 12, 49) or αGalCer (17, 19, 26, 27). However, the B16 melanoma does not express CD1d (50, 51 and data not shown), excluding a direct presentation of αGalCer. We stably transfected B16 melanoma cells with mouse CD1d (B16-CD1d) and used them as targets in an in vivo cytotoxicity assay. B16 or B16-CD1d cells were loaded with αGalCer, mixed 1:1 with RMA cells as internal control, labeled with CFSE, and incubated for 4 h with iNKT cell-enriched splenocytes in vitro. Whereas no cytotoxicity was detected against the control B16 melanoma (data not shown), the αGalCer-loaded B16-CD1d cells were eliminated (Fig. 7A). We also observed an upregulation of CD95 on the B16-CD1d melanomas (Fig. 7B), but not on the B16 (data not shown), during the 4-h incubation with the splenocytes. To determine the CD95/CD178 dependency of the observed cytotoxicity, we inhibited this death pathway using a blocking anti-CD178 Ab. This resulted in a decrease of the cytotoxicity against the B16-CD1d cells of 41–59% (Fig. 7A), indicating that the CD95/CD178 pathway is important for the observed cytotoxicity. We next determined whether expression of CD1d on the B16 melanoma could also confer protection in vivo. B16 and B16-CD1d melanomas were pulsed shortly (90 min) with αGalCer before i.v. injection, and the numbers of formed tumor metastases in the lung were recorded 14 d later. It has previously been shown that loading of B16 cells in vitro with αGalCer for 2 d protects mice from tumor metastases (51, 52). In contrast, αGalCer loading for only 1.5 h resulted in a minor protective effect compared with unloaded B16 tumor cells (Fig. 7C). In contrast, αGalCer loading of B16-CD1d melanomas protected the animals from metastases (Fig. 7C). These data indicate that direct Ag presentation by the B16-CD1d melanoma leads to an efficient eradication of the tumor in vivo. CD1d expression by B16 melanoma cells augments αGalCer-mediated protection. A and B, B16-CD1d melanoma cells were loaded with αGalCer (250 ng/ml, 1 h) mixed with equal numbers of RMA cells and incubated 4 h with iNKT cell-enriched splenocytes. A, Cytotoxicity against B16-CD1d with and without the presence of anti-CD178Ab (20 μg/ml) was determined 4 h later. E:T ratios were calculated based on the ratio of iNKT cell numbers in the cell suspensions to the αGalCer-loaded B16-CD1d tumor cells. B, CD95 expression on B16-CD1d after this incubation period (black line, second number) and on untreated B16-CD1d control cells (tinted, first number). The numbers in histograms denote the geometric mean values of CD95 on B16-CD1d cells. Representative data from three experiments are shown. C, B16 and B16-CD1d melanoma cells were either loaded with αGalCer (250 ng/ml, 90 min) or mock treated and 1 × 105 of tumor cells were injected i.v. as indicated. Fourteen days later tumor metastases in the lung were counted. p (B16 ± αGalCer versus B16-CD1d ± αGalCer) < 0.001. The graph summarizes data from three independent experiments with at least nine mice per group. Although it is well known that iNKT cells can augment the cytotoxic activity of NK cells, herein we have analyzed the cellular and molecular parameters involved in the in vivo and in vitro Ag-dependent cytotoxicity of target cells by iNKT cells. In particular, we provide evidence that the in vivo cytotoxicity of iNKT cells correlates directly with CD1d expression levels on target cells and with the potency of the iNKT cell Ag. The interaction of iNKT cells with their targets led to a mutual activation of the both cell types, and the iNKT cells from spleen and liver showed a similar degree of cytotoxicity. Most surprising, we show that the Ag-specific cytotoxicity of iNKT cells in vivo relies almost entirely on the interaction between CD95 (Fas) and CD178 (FasL). It has been reported for αGalCer and its derivatives OCH and C-Gly that the intensity of cytokine produced by the iNKT cells following i.v. injection correlated directly with the antigenic potency (i.e., αGalCer > OCH > C-Gly) (43). Using αGalCer, OCH, C-Gly, and a synthetic version of the S. yanoikuyae–derived Ag GalA-GSL, we demonstrate that the antigenic strength directly correlated in a similar fashion with the iNKT cell in vivo cytotoxicity (Fig. 5). Surprisingly, limited cytotoxicity was observed with the weaker Ags, including C-Gly and the S. yanoikuyae Ag GalA-GSL. These data suggest that the described in vivo potency of C-Gly in tumor rejection (53) or the antimalarial response (54) may not be due principally to antigenic-specific killing by iNKT cells. Similarly, although mice that have iNKT cells clear S. yanoikuyae more rapidly when compared with iNKT cell-deficient animals, this also may occur independently of an Ag-specific cytotoxic function (48, 55). Our experiments focused on testing the immediate or short-term cytotoxic function of iNKT cells, and therefore we cannot rule out the possibility that iNKT cell-mediated Ag-specific killing is important in immune responses that take place over several days, such as during tumor or pathogen challenges. Furthermore, under different circumstances, some of the less potent compounds may stimulate cytotoxic activity more efficiently. For example, dendritic cells may be more effective at taking up C-Gly and loading it into CD1d than in B lymphocytes; similarly, uptake of whole Sphingomonas bacteria or membrane fragments may promote more effective loading of GalA-GSL into the groove of mouse CD1d. Additionally, the overall avidity of an Ag depends not only on its strength of interaction with the TCR when bound to CD1d (i.e., the TCR affinity), but also on its density, that is, on the amount of available epitopes presented and recognized by the T cell. In line with this notion, we show that the iNKT cell cytotoxicity in vivo also correlated with the amount of CD1d expressed on the target cells (Fig. 1). Although NK cells expressed lower levels of CD1d than did any other cell type analyzed (Fig. 1C), it was still surprising that we did not observe αGalCer-induced cytotoxicity against splenic NK cell targets (Fig. 1B). The expression of CD95 induced on the NK cells was lower than on B cells (data not shown), which together with the low amount of CD1d may explain the reduced NK cell susceptibility to killing. Furthermore, several mechanisms have been reported that protect cytotoxic lymphocytes against cytotoxicity (56–58), which could be involved in our experimental system as well. The two major mechanisms to induce cell death by cytotoxic lymphocytes involve, on the one hand, different surface receptors, most prominently CD95/CD178, but also TNF-α/TNFR and TRAIL/TRAILR, or alternatively, soluble mediators, mainly perforin and granzymes (59, 60). iNKT cell express CD178 following activation with Con A (61) and αGalCer (Fig. 6) (17, 62). Furthermore, human iNKT cell lines have been reported to express TRAIL (CD253) following restimulation with αGalCer-loaded DCs, and they exerted TRAIL-dependent cytotoxic activity against some leukemia cells in vitro (62, 63). Despite this diversity of mechanisms, most studies have implicated the perforin/granzyme B pathway in the cytotoxic activity of iNKT cells (19, 64–66). However, these studies relied on chemical inhibitors of granule release, and most likely addressed NK-type cytotoxicity rather than Ag-specific CD1d-dependent cytotoxicity. A typical experimental set-up for these studies involved the injection of αGalCer i.v., and the determination of the cytotoxicity of purified splenocytes 1 d later against NK cell-sensitive targets in vitro. Such an approach does not directly address the mechanisms or even the role of iNKT cells in the observed cytotoxicity. Indeed, in several studies it was shown that the perforin required for the observed cytotoxicity against tumors resided not within the iNKT cells, but rather in NK cells that had been activated downstream of the iNKT cell activation (25, 67, 68). In fact, this trans-activation of NK cells appears to be the general mechanism for the αGalCer-induced antitumor activity. Following αGalCer exposure, NK cells are activated by several mechanisms, including iNKT cell-derived IFN-γ [in mice (27, 67, 69–71)] or IL-2 [in humans (24)], leading to NK cell cytotoxicity and cytokine production. The importance of this trans-activation of NK cells by iNKT cell-derived IFN-γ has been demonstrated for pathogen infections (39, 72) and in tumor models (17, 27, 67, 73). Apparently, NK cells act generally in amplifying the iNKT cell signal in a feed-forward loop (14, 49, 74). In contrast with these earlier studies, our experiments were designed to investigate the direct, short-term, CD1d-dependent, Ag-specific cytotoxicity of iNKT cells. CD1d-dependent cytotoxicity of iNKT cells has been reported previously (2, 24, 29, 30, 65, 75–77), but the underlying mechanism was not addressed. In this study, we demonstrate that the CD1d and Ag-dependent cytotoxicity of iNKT cells requires the CD95/CD178 pathway and is completely independent of the perforin/granzyme pathway (Fig. 6). 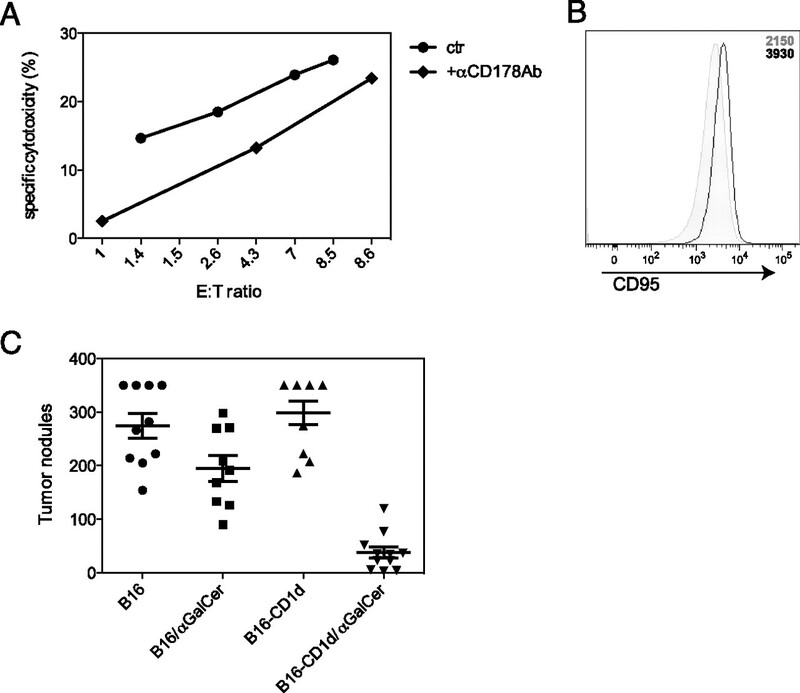 iNKT cells expressed CD178 following interaction with αGalCer-loaded B cell targets and induced CD95 expression on these target B cells (Fig. 6). The remaining, relatively minor cytotoxicity observed in the absence of CD95 and perforin expression could be due to TRAIL (CD253) and/or TNF-α–mediated apoptotic pathways. However, we could not detect any TRAIL staining (clone N2B2) on iNKT cells by flow cytometry in our experiments (data not shown). Our data are in agreement with earlier studies suggesting an iNKT cell-mediated elimination of B cells during nickel tolerance that was dependent upon the CD95/CD178 pathway (78) and an elimination of hepatotcytes following ConA-induced hepatitis that depended on both the CD95/CD178 and the perforin/granzyme pathway (61). However, the requirements for expression of CD95 by iNKT cells, as well as the role of CD1d and TCR recognition, were not addressed in these studies. Numerous studies have established the strong antitumor activity following the activation of iNKT cells with IL-12 (7–14) or αGalCer (1, 2, 15–27). Importantly, NKT cells that were not intentionally Ag-stimulated were also shown to be involved in tumor surveillance (25, 68, 79, 80). It has been demonstrated previously that loading of αGalCer onto B16 and other tumor lines can induce a strong immune response and protection against tumor growth in vivo (51, 52). However, in these studies the loading of αGalCer was carried out for 2 d, which may allow the tumor cells to take up high amounts of this glycolipid Ag (51). Consequently, in this experimental format, the responses of iNKT cells (51) and dendritic cells (52), after injection of either αGalCer-loaded B16 or αGalCer-loaded B16-CD1d cells, were indistinguishable. This indicates that direct presentation of αGalCer by the tumor cells was not required, suggesting that potent cross-presentation of αGalCer can occur in vivo. As mentioned above, the antitumor response following αGalCer treatment in vivo depends on IFN-γ–mediated trans-activation of NK cells (17, 67, 81). Furthermore, it has been shown that IFN-γ induces upregulation of CD95 on B16 tumor cells (82, 83). Therefore, the αGalCer-induced antitumor response for most of these studies can be explained by the trans-activation of NK cells, which then attack the tumor. In line with this interpretation is the observation that protocols that augment the IFN-γ response by iNKT cells, thereby intensifying the NK cell trans-activation, augment the antitumor response. This could be achieved either by using dendritic cells loaded with αGalCer instead of free αGalCer (22, 84), or by utilizing the Th1 cytokine–inducing iNKT cell Ag C-Gly (85). In contrast, we show herein that expression of CD1d by B16 melanoma cells makes them susceptible to cognate Ag-dependent cytotoxicity by iNKT cells, mainly via the CD95/CD178 pathway. Furthermore, we demonstrate that following a short pulsing of B16 tumor cells with αGalCer, the efficiency of the antitumor response depends on the expression of CD1d and most probably on direct presentation of the Ag by the tumor cells (Fig. 7). Several studies have shown that tumor cells that express CD1d can be lysed by iNKT cells in vitro when the tumor cells were loaded with αGalCer (24, 30, 65, 76, 77). In this study, we extended these reports by demonstrating the CD1d dependency of the Ag-specific iNKT cell cytotoxicity against tumors in vivo (Fig. 7). Therefore, our data suggest that activation of iNKT cells for an antitumor therapy, a strategy currently applied in clinical trials (86), might be most effective against those tumors that express CD1d. In such cases, the activation of iNKT cells might facilitate cognate-Ag killing as well as trans-activation of other cell types. We thank Archana Khurana for excellent technical assistance. We are grateful for the scientific contributions of Barbara Sullivan, Bo Pei, Aaron Tyznik, and Jennifer Matsuda. This work was supported in part by National Institutes of Health Grants RO1 AI45053 and R37 AI71922 (to M.K. ), an Outgoing International Fellowship by the Marie Curie Actions (to G.W. ), and by a long-term European Molecular Biology Organization fellowship and a fellowship from the Swiss National Science Foundation (to P.K.). invariant Vα14 to Jα18 TCR rearrangement.
. 1995. Structure-activity relationship of α-galactosylceramides against B16-bearing mice. J. Med. Chem. 38: 2176–2187.
. 1997. CD1d-restricted and TCR-mediated activation of vα14 NKT cells by glycosylceramides. Science 278: 1626–1629.
. 2007. CD1-restricted T cells and tumor immunity. Curr. Top. Microbiol. Immunol. 314: 293–323. 2005. Toward an understanding of NKT cell biology: progress and paradoxes. Annu. Rev. Immunol. 23: 877–900.
. 2007. NKT cells in immunoregulation of tumor immunity: a new immunoregulatory axis. Trends Immunol. 28: 491–496.
. 2007. The unique role of natural killer T cells in the response to microorganisms. Nat. Rev. Microbiol. 5: 405–417.
. 1995. Cytotoxic NK1.1 Ag+ αβ T cells with intermediate TCR induced in the liver of mice by IL-12. J. Immunol. 154: 4333–4340.
. 1996. Interleukin-12 induces cytotoxic NK1+ αβ T cells in the lungs of euthymic and athymic mice. Immunology 88: 82–89.
. 1996. LPS induces NK1.1+ αβ T cells with potent cytotoxicity in the liver of mice via production of IL-12 from Kupffer cells. J. Immunol. 156: 2436–2442.
. 2000. Relative contribution of NK and NKT cells to the anti-metastatic activities of IL-12. Int. Immunol. 12: 909–914.
. 1996. Liver NK1.1+CD4+ αβ T cells activated by IL-12 as a major effector in inhibition of experimental tumor metastasis. J. Immunol. 156: 3366–3373.
. 1997. Requirement for Vα14 NKT cells in IL-12-mediated rejection of tumors. Science 278: 1623–1626.
. 1998. Critical role of NK1+ T cells in IL-12-induced immune responses in vivo. J. Immunol. 160: 16–19.
. 2000. The anti-tumor activity of IL-12: mechanisms of innate immunity that are model and dose dependent. J. Immunol. 165: 2665–2670.
. 1998. Antitumor activity of α-galactosylceramide, KRN7000, in mice with EL-4 hepatic metastasis and its cytokine production. Oncol. Res. 10: 561–568.
. 1998. Treatment of hepatic metastasis of the colon26 adenocarcinoma with an α-galactosylceramide, KRN7000. Cancer Res. 58: 1202–1207.
. 2001. Mechanisms of the antimetastatic effect in the liver and of the hepatocyte injury induced by α-galactosylceramide in mice. J. Immunol. 166: 6578–6584.
. 2000. Antitumor activity of α-galactosylceramide, KRN7000, in mice with the melanoma B16 hepatic metastasis and immunohistological study of tumor infiltrating cells. Oncol. Res. 12: 51–58.
. 1998. Natural killer-like nonspecific tumor cell lysis mediated by specific ligand-activated Vα14 NKT cells. Proc. Natl. Acad. Sci. USA 95: 5690–5693.
. 1999. Antitumor cytotoxicity mediated by ligand-activated human Vα24 NKT cells. Cancer Res. 59: 5102–5105.
. 1999. The natural killer T (NKT) cell ligand α-galactosylceramide demonstrates its immunopotentiating effect by inducing interleukin (IL)-12 production by dendritic cells and IL-12 receptor expression on NKT cells. J. Exp. Med. 189: 1121–1128.
. 1999. Cutting edge: inhibition of experimental tumor metastasis by dendritic cells pulsed with α-galactosylceramide. J. Immunol. 163: 2387–2391.
. 2000. α-Glycosylceramides enhance the antitumor cytotoxicity of hepatic lymphocytes obtained from cancer patients by activating CD3−CD56+ NK cells in vitro. J. Immunol. 165: 1659–1664.
. 2001. Human NKT cells mediate antitumor cytotoxicity directly by recognizing target cell CD1d with bound ligand or indirectly by producing IL-2 to activate NK cells. J. Immunol. 167: 3114–3122.
. 2001. NK cells and NKT cells collaborate in host protection from methylcholanthrene-induced fibrosarcoma. Int. Immunol. 13: 459–463.
. 2002. IFN-γ-mediated inhibition of tumor angiogenesis by natural killer T-cell ligand, α-galactosylceramide. Blood 100: 1728–1733.
. 2001. Critical contribution of IFN-γ and NK cells, but not perforin-mediated cytotoxicity, to anti-metastatic effect of α-galactosylceramide. Eur. J. Immunol. 31: 1720–1727.
. 2006. Immediate antigen-specific effector functions by TCR-transgenic CD8+ NKT cells. Eur. J. Immunol. 36: 570–582.
. 2004. The VITAL assay: a versatile fluorometric technique for assessing CTL- and NKT-mediated cytotoxicity against multiple targets in vitro and in vivo. J. Immunol. Methods 285: 25–40.
. 2002. Human umbilical cord blood NK T cells kill tumors by multiple cytotoxic mechanisms. Hum. Immunol. 63: 164–175.
. 2002. Progression of armed CTL from draining lymph node to spleen shortly after localized infection with herpes simplex virus 1. J. Immunol. 168: 834–838.
. 1998. CD1d-mediated recognition of an α-galactosylceramide by natural killer T cells is highly conserved through mammalian evolution. J. Exp. Med. 188: 1521–1528.
. 2002. 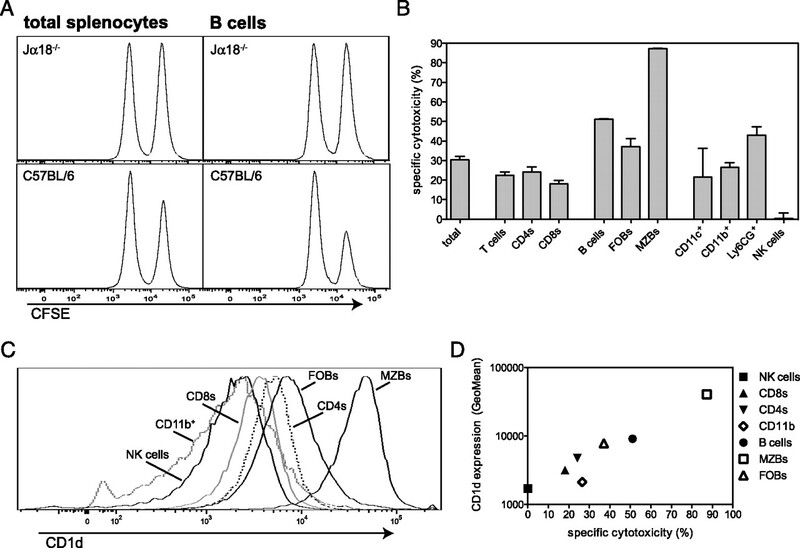 CD1 tetramers: a powerful tool for the analysis of glycolipid-reactive T cells. J. Immunol. Methods 268: 107–121.
. 2000. Tracking the response of natural killer T cells to a glycolipid antigen using CD1d tetramers. J. Exp. Med. 192: 741–754.
. 2004. Guidelines for the presentation of flow cytometric data. Methods Cell Biol. 75: 241–256.
. 1998. CD1 expression defines subsets of follicular and marginal zone B cells in the spleen: β2-microglobulin-dependent and independent forms. J. Immunol. 161: 1710–1717.
. 1998. CD1.1 expression by mouse antigen-presenting cells and marginal zone B cells. J. Immunol. 160: 3121–3127.
. 1997. Mouse CD1-specific NK1 T cells: development, specificity, and function. Annu. Rev. Immunol. 15: 535–562.
. 2002. The unconventional lifestyle of NKT cells. Nat. Rev. Immunol. 2: 557–568.
. 2005. Differential antitumor immunity mediated by NKT cell subsets in vivo. J. Exp. Med. 202: 1279–1288.
. 2001. Neighborhood politics: the immunoregulatory function of organ-resident liver endothelial cells. Trends Immunol. 22: 432–437. 2003. Hepatic T cells and liver tolerance. Nat. Rev. Immunol. 3: 51–62.
. 2010. Mechanisms for glycolipid antigen-driven cytokine polarization by Vα14i NKT cells. J. Immunol. 184: 141–153.
. 2001. A synthetic glycolipid prevents autoimmune encephalomyelitis by inducing TH2 bias of natural killer T cells. Nature 413: 531–534.
. 2004. The clinical implication and molecular mechanism of preferential IL-4 production by modified glycolipid-stimulated NKT cells. J. Clin. Invest. 113: 1631–1640.
. 2003. Another view of T cell antigen recognition: cooperative engagement of glycolipid antigens by Va14Ja18 natural T(iNKT) cell receptor. [corrected] J. Immunol. 171: 4539–4551.
. 2006. Design of natural killer T cell activators: structure and function of a microbial glycosphingolipid bound to mouse CD1d. Proc. Natl. Acad. Sci. USA 103: 3972–3977.
. 2005. Recognition of bacterial glycosphingolipids by natural killer T cells. Nature 434: 520–525.
. 2002. NKT cells: conductors of tumor immunity? Curr. Opin. Immunol. 14: 165–171.
. 2002. Regulation of CD1d expression by murine tumor cells: escape from immunosurveillance or alternate target molecules? Int. J. Cancer 98: 389–397.
. 2007. Tumor cells loaded with α-galactosylceramide induce innate NKT and NK cell-dependent resistance to tumor implantation in mice. J. Immunol. 178: 2853–2861.
. 2007. Cross-presentation of glycolipid from tumor cells loaded with α-galactosylceramide leads to potent and long-lived T cell mediated immunity via dendritic cells. J. Exp. Med. 204: 2641–2653.
. 2004. The C-glycoside analogue of the immunostimulant α-galactosylceramide (KRN7000): synthesis and striking enhancement of activity. Angew. Chem. Int. Ed. Engl. 43: 3818–3822.
. 2003. Superior protection against malaria and melanoma metastases by a C-glycoside analogue of the natural killer T cell ligand α-galactosylceramide. J. Exp. Med. 198: 1631–1641.
. 2005. Exogenous and endogenous glycolipid antigens activate NKT cells during microbial infections. Nature 434: 525–529.
. 2002. Surface cathepsin B protects cytotoxic lymphocytes from self-destruction after degranulation. J. Exp. Med. 196: 493–503.
. 1996. A cytosolic granzyme B inhibitor related to the viral apoptotic regulator cytokine response modifier A is present in cytotoxic lymphocytes. J. Biol. Chem. 271: 27802–27809.
. 2007. Expression of high levels of human proteinase inhibitor 9 blocks both perforin/granzyme and Fas/Fas ligand-mediated cytotoxicity. Cell. Immunol. 245: 32–41.
. 2002. Cytotoxic T lymphocytes: all roads lead to death. Nat. Rev. Immunol. 2: 401–409.
. 2002. Lymphocyte-mediated cytotoxicity. Annu. Rev. Immunol. 20: 323–370.
. 2000. Augmentation of Vα14 NKT cell-mediated cytotoxicity by interleukin 4 in an autocrine mechanism resulting in the development of concanavalin A-induced hepatitis. J. Exp. Med. 191: 105–114.
. 2006. Chemotherapy pretreatment sensitizes solid tumor-derived cell lines to Vα24+ NKT cell-mediated cytotoxicity. Int. J. Cancer 119: 1630–1637.
. 2001. TRAIL expression by activated human CD4+ Vα24 NKT cells induces in vitro and in vivo apoptosis of human acute myeloid leukemia cells. Blood 97: 2067–2074.
. 2000. Human invariant vα24+ natural killer T cells activated by α-galactosylceramide (KRN7000) have cytotoxic anti-tumour activity through mechanisms distinct from T cells and natural killer cells. Immunology 99: 229–234.
. 2003. Expression of CD1d by myelomonocytic leukemias provides a target for cytotoxic NKT cells. Leukemia 17: 1068–1077.
. 2000. Analysis of human Vα24+CD4+ NKT cells activated by α-glycosylceramide-pulsed monocyte-derived dendritic cells. J. Immunol. 164: 4458–4464.
. 2002. Sequential production of interferon-gamma by NK1.1+ T cells and natural killer cells is essential for the antimetastatic effect of α-galactosylceramide. Blood 99: 1259–1266.
. 2002. A critical role for natural killer T cells in immunosurveillance of methylcholanthrene-induced sarcomas. J. Exp. Med. 196: 119–127.
. 1999. Cutting edge: cross-talk between cells of the innate immune system: NKT cells rapidly activate NK cells. J. Immunol. 163: 4647–4650.
. 2000. Selective induction of NK cell proliferation and cytotoxicity by activated NKT cells. Eur. J. Immunol. 30: 985–992.
. 2000. Natural killer T cell activation inhibits hepatitis B virus replication in vivo. J. Exp. Med. 192: 921–930.
. 2005. Vα14i NKT cells are innate lymphocytes that participate in the immune response to diverse microbes. J. Clin. Immunol. 25: 522–533.
. 2000. The interface between innate and acquired immunity: glycolipid antigen presentation by CD1d-expressing dendritic cells to NKT cells induces the differentiation of antigen-specific cytotoxic T lymphocytes. Int. Immunol. 12: 987–994.
. 2002. Natural killer T (NKT) cells and their role in antitumor immunity. Crit. Rev. Oncol. Hematol. 41: 287–298.
. 2006. CD1d expression level in tumor cells is an important determinant for anti-tumor immunity by natural killer T cells. Leuk. Lymphoma 47: 2218–2223.
. 2004. CD1d is expressed on B-chronic lymphocytic leukemia cells and mediates α-galactosylceramide presentation to natural killer T lymphocytes. Int. J. Cancer 109: 402–411.
. 2005. CD1d expression on B-precursor acute lymphoblastic leukemia subsets with poor prognosis. Leukemia 19: 551–556.
. 2006. Oral nickel tolerance: Fas ligand-expressing invariant NK T cells promote tolerance induction by eliciting apoptotic death of antigen-carrying, effete B cells. J. Immunol. 176: 4581–4589.
. 1997. Involvement of NK1+CD4−CD8− αβ T cells and endogenous IL-4 in non-MHC-restricted rejection of embryonal carcinoma in genetically resistant mice. J. Immunol. 158: 5338–5348.
. 2003. CD4+CD25+ T cells responding to serologically defined autoantigens suppress antitumor immune responses. Proc. Natl. Acad. Sci. USA 100: 10902–10906.
. 2005. Sequential activation of NKT cells and NK cells provides effective innate immunotherapy of cancer. J. Exp. Med. 201: 1973–1985.
. 1998. T cell-mediated, IFN-γ-facilitated rejection of murine B16 melanomas. J. Immunol. 161: 897–908.
. 2001. Comparative analysis of immunocritical melanoma markers in the mouse melanoma cell lines B16, K1735 and S91-M3. Melanoma Res. 11: 21–30.
. 2002. Prolonged IFN-γ-producing NKT response induced with α-galactosylceramide-loaded DCs. Nat. Immunol. 3: 867–874.
. 2006. Glycolipid α-C-galactosylceramide is a distinct inducer of dendritic cell function during innate and adaptive immune responses of mice. Proc. Natl. Acad. Sci. USA 103: 11252–11257.
. 2008. Clinical applications of natural killer T cell-based immunotherapy for cancer. Cancer Sci. 99: 638–645.